This poor bird got his head chopped off by the window molding. I want to help him keep it! In the top photo, you see the bird and the point where his head got cut off. 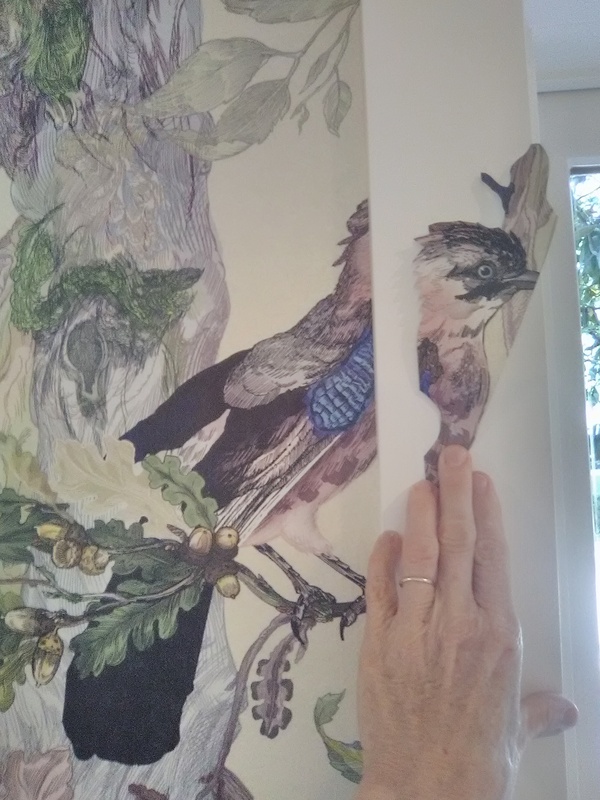 On the right side, against the window molding, I am holding a head that I cut from scrap wallpaper. I’ve trimmed it to fit the bird’s body, and to look as natural as possible by sculpting it and cutting around ruffled feathers. In the second photo, I am holding the appliqué in place. 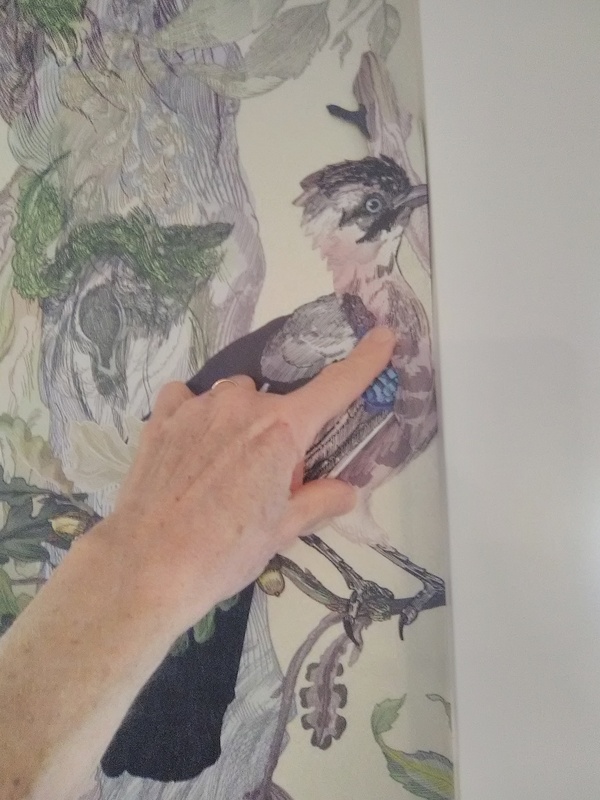 Once it is pasted and applied, even though it is far removed from what the bird is supposed to look like, the bird looks intact. 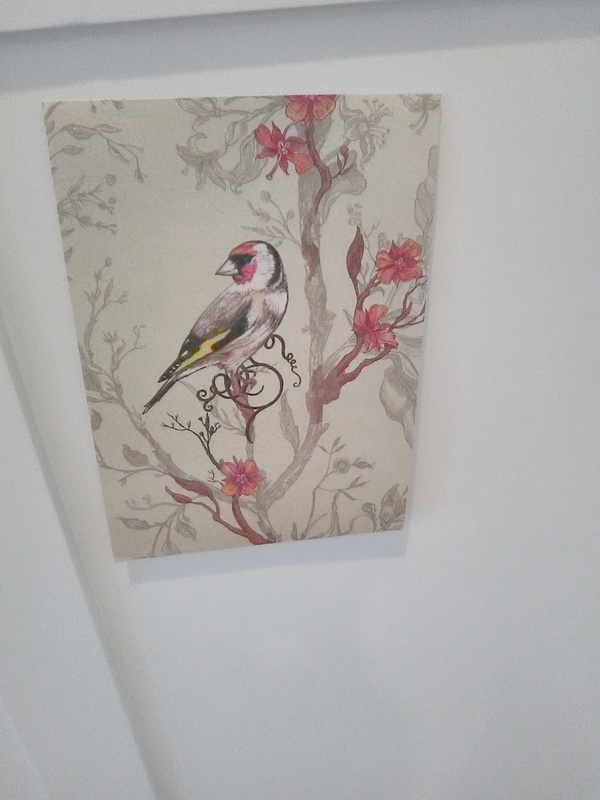 The casual observer would never notice that this bird has been altered. This is some novel stuff! 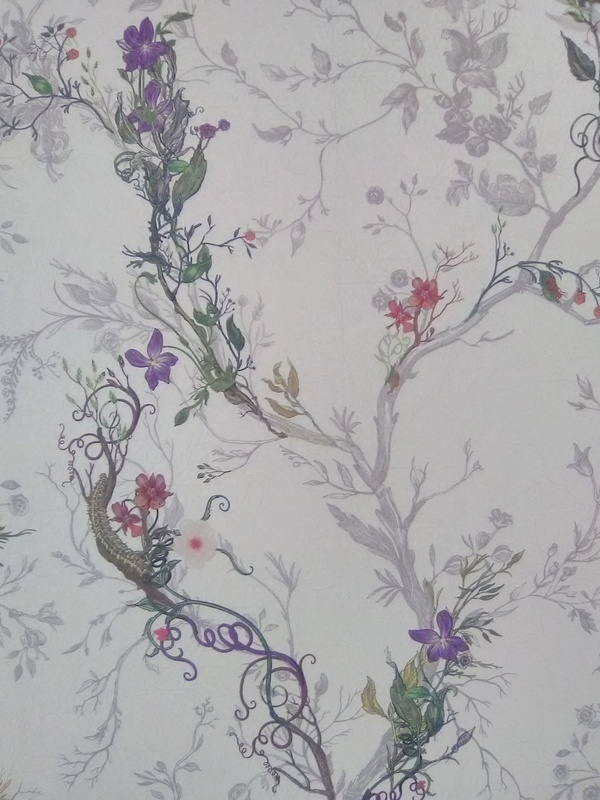 This wallpaper pattern is something like a mural, but with a little more brain-bending. It is one continuous design, with no element or motif repeating or showing up more than once in the 33′ length of each bolt. It’s a good thing that no one was living in the house, and that furniture had not been moved in yet. Because I needed a LOT of floor space to roll out and study each bolt. I had to compare the height of the walls and the length of each strip that I needed, to the placement of various animals in the design. 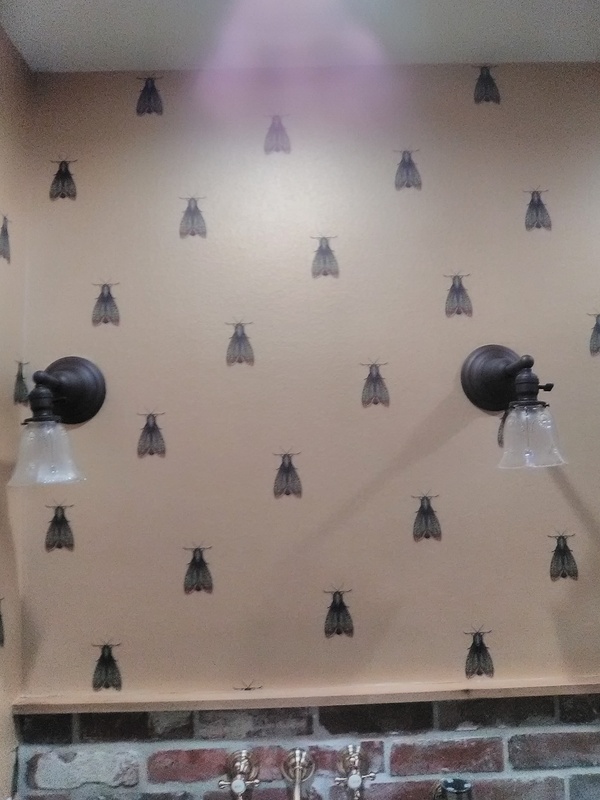 This enabled me to plot where on the wall any given critter would appear, and to get as many creatures as possible on each strip, all while accommodating the homeowner’s preference for a few special ones. I rolled the entire 33′ long bolt out on the floor, took measurements, and used blue tape to indicate the tops and bottoms of each strip. This enabled me to fiddle with various layouts and animal positions, and I could make changes if needed. We needed 22 strips, and I was getting 5 strips out of each double roll bolt. So after I cut five strips from the first bolt, I moved on to the second bolt. 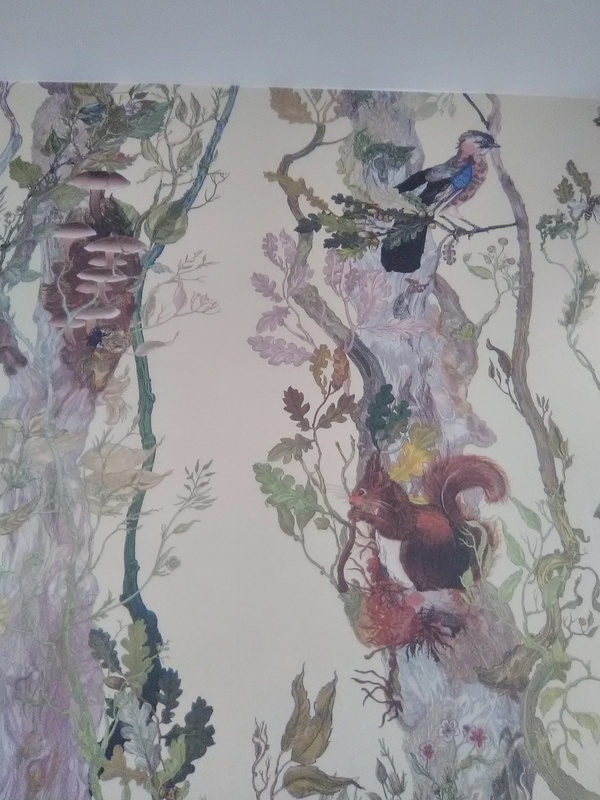 To give a more random look, I wanted the same animals (the squirrels, for instance) to be placed at different heights moving around the room. So when I started plotting my strips and cuts from the second bolt, I made sure that the creatures landed at different heights from the first bolt. That first bolt and the animals’ positions I called “A” and the second bolt and positions were “B”. I only got four strips out of the “B” bolt. This meant that any given motif would appear at the same height on the wall only every 9th strip. This would give a pleasing, random look. The plan was to hang all the strips taken in order from the “A” bolt first, followed by strips taken sequentially from the “B” bolt. Repeat with another “A” and another “B”, and then back to an “A” bolt again. Working around the doors and windows, the room was divided into four sections. The next step was to get all those strips of paper placed in proper sequential order, standing in queue all around the room – all while figuring the center point of each of those four spaces and plotting which strips would be placed flanking the middle of that wall. 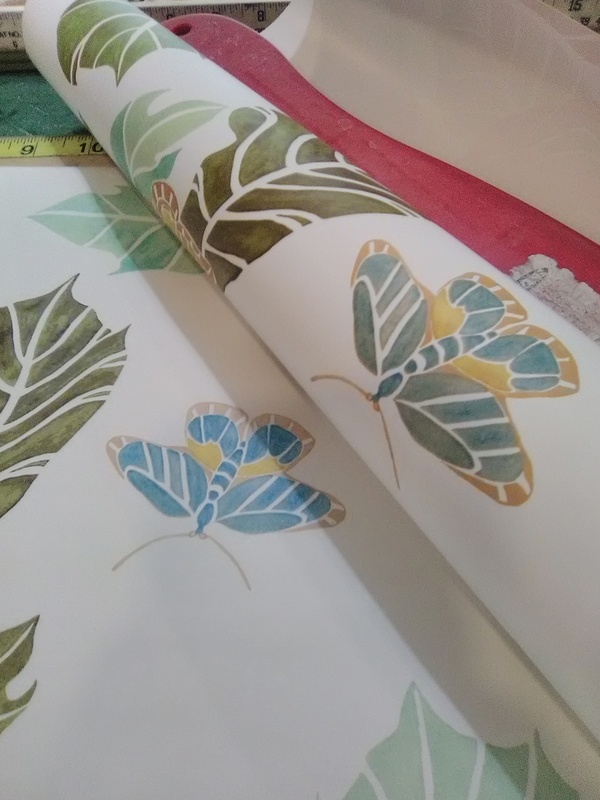 Some cool features of this pattern is that it was placed smack down the middle of the 20.5″ wide strip, which made it a lot easier to center and balance the design than if it had been placed off-center. Also, the design did not reach across any seams, so (other than plotting the height where each critter would fall) there was no pattern match. This made it a lot easier to accommodate crooked walls and un-level ceiling and wainscoting. The dimensions of the room were also amazingly in sync with those of the wallpaper pattern. Vertically, the 82″ height of each wall / strip worked with the placement of animals on the paper, so virtually all animals were kept intact. There was only one bird who got cut in half at the wainscoting, and that happened only every 9th strip (twice in the whole room). Horizontally the pattern worked out just as incredibly. The width of all of the walls worked out to be within an inch or two of a multiple of the width of the paper. So centering the strips / pattern on each wall resulted in a look as if the design were “framed” by the door and window moldings. Sorry, no pics. The downside was, just by happenstance, I ended up with an extraordinary number 1″-2″ strips that had to be squeezed in. Time-consuming and PITA. I centered the pattern on each of these four wall spaces. But that meant that the rhythm of the pattern would get screwed up as it passed over the door to the butler’s pantry, two windows, and the 12′ wide entry to the hallway. Here again, the dimensions worked amazingly well, and so did the very accommodating pattern. In the short 10″ high areas over these doors, I was able to “fudge” the pattern by slicing strips vertically along a tree trunk, for instance, and then overlapping the two sections an inch or two, to “shrink” the strip’s width. Making an inch of width disappear from each of seven strips is barely noticeable, and maintains the rhythm that the viewer’s eye wants to see as it travels around the room. Again, sorry, no pictures. The walls had been primed a few days before; just laying out and hanging the paper took me 12 hours. 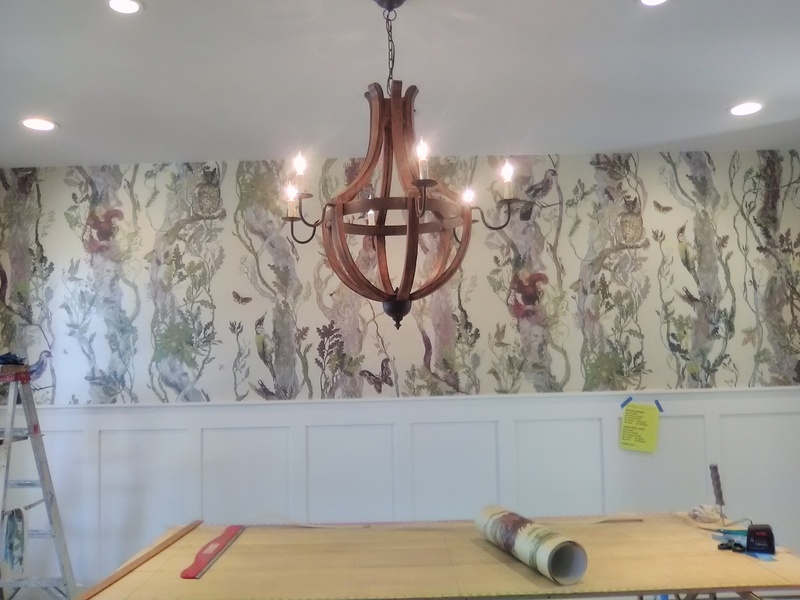 I hung this “Indie Wood” pattern by Timorous Beasties on the top 5′ above paneled wainscoting in a new home in the Woodland Heights neighborhood of Houston. It’s made of non-woven material, and can be hung by paste-the-wall or paste-the-paper (which was what I opted to do). Non-wovens are strong and have a high fiber-glass content. They are designed to strip off the wall easily when it’s time to redecorate. Additionally, they are dimensionally-stable – they do not expand when wet with paste. This makes it much easier to plot placement of strips and motifs. The interior designer for this job is Stacie Cokinos of Cokinos Design. Say it in French and it sounds beautifully exotic. In reality, they’re moths. 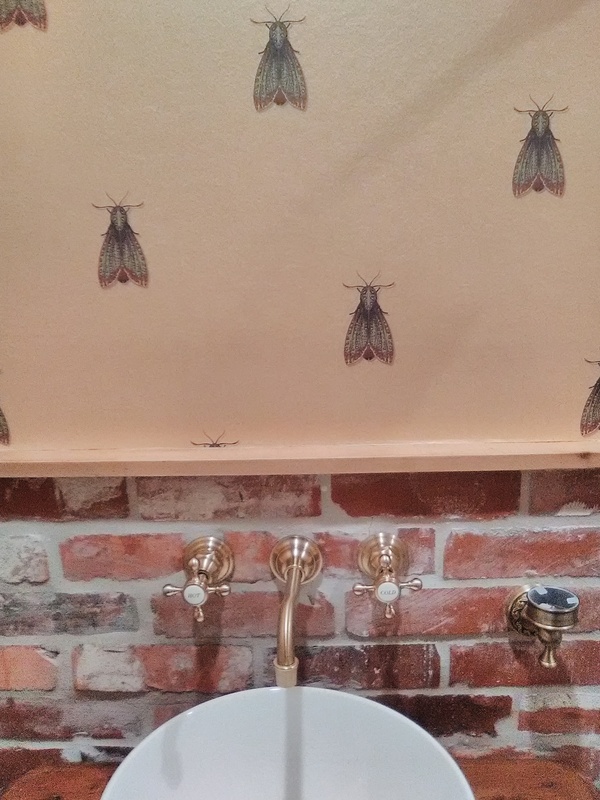 This rhythmic pattern by Timorous Beasties went in a powder room in a new home in the Woodland Heights neighborhood of Houston. Note the brick and wooden accents in the room. 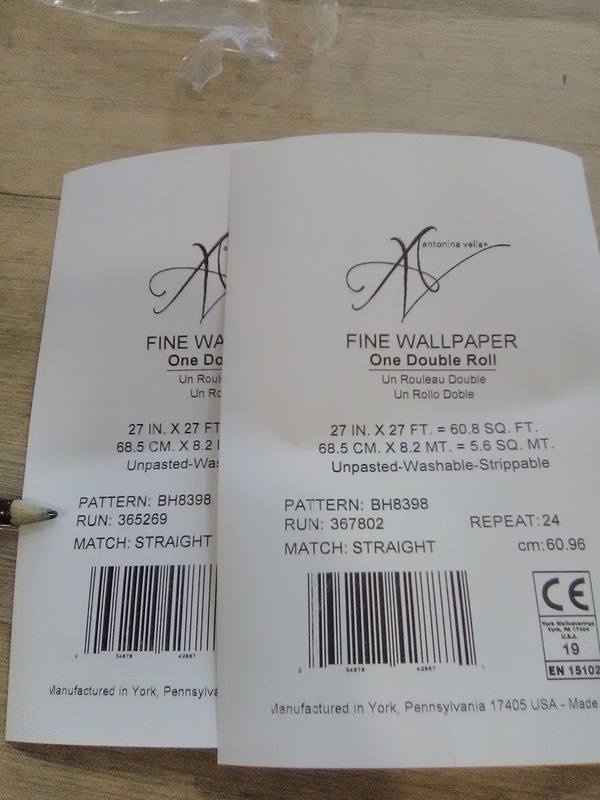 Whereas most wallpaper patterns repeat either every strip or every other strip (half-drop), Papillion de Nuit has a quarter-drop pattern match, which means that the pattern repeats itself every fourth strip. It’s extremely difficult to figure out and to keep properly placed on the wall, especially when every motif is identical. In addition, the powder room had some challenging features of its own. The whole job took me about 14 hours! It looks great, though. It’s made of fiberglass-based non-woven material. This can be installed via the paste-the-wall method, or by pasting the paper (which is what I generally do). 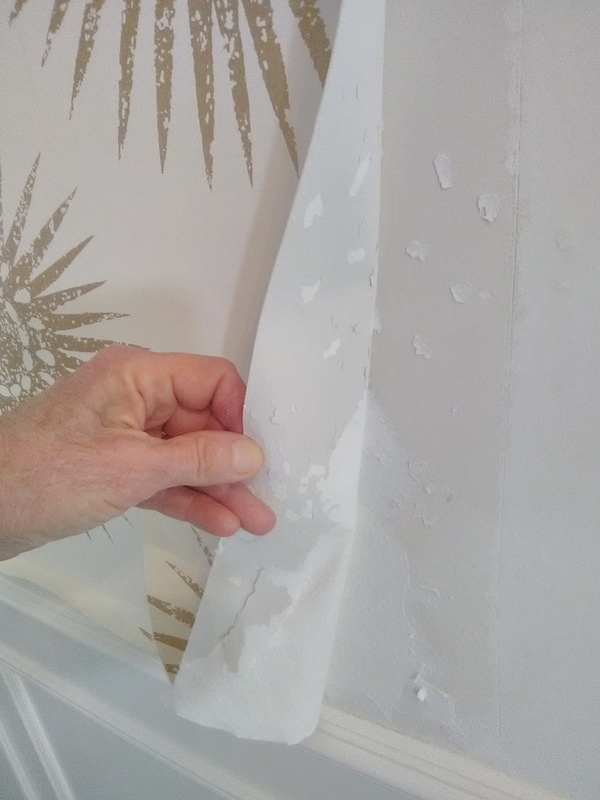 Some features of this material is that it is designed to be stripped off the wall easily when it’s time to redecorate, and that it is dimensionally-stable and won’t expand or stretch when wetted by the paste. 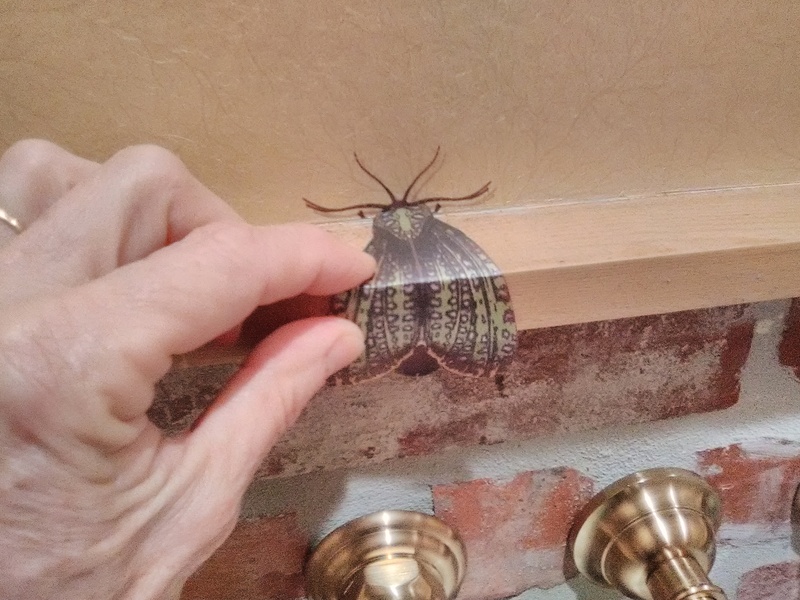 Re the Papillion de Nuit wallpaper pattern in my other post, I couldn’t avoid decapitating this moth at the bottom of this wall. I’m thinking of appliquéing his body onto the wooden trim. Update two days later … The interior designer loved the idea, so … it’s done! The homeowner moves in in a week, and we’ll learn then what she thinks. 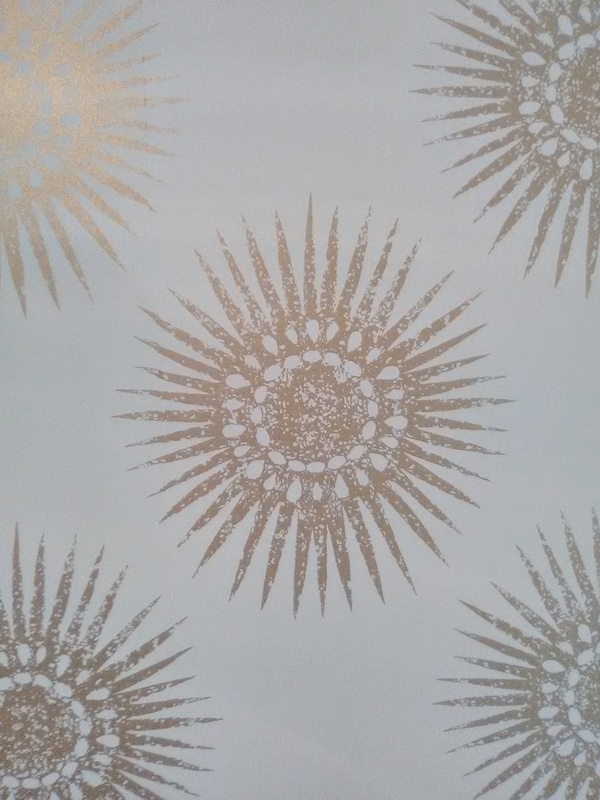 The top photo shows the wallpaper sample the client had received and made her selection from. She had taped it to the wall in the dining room, to designate which paper was to go there. 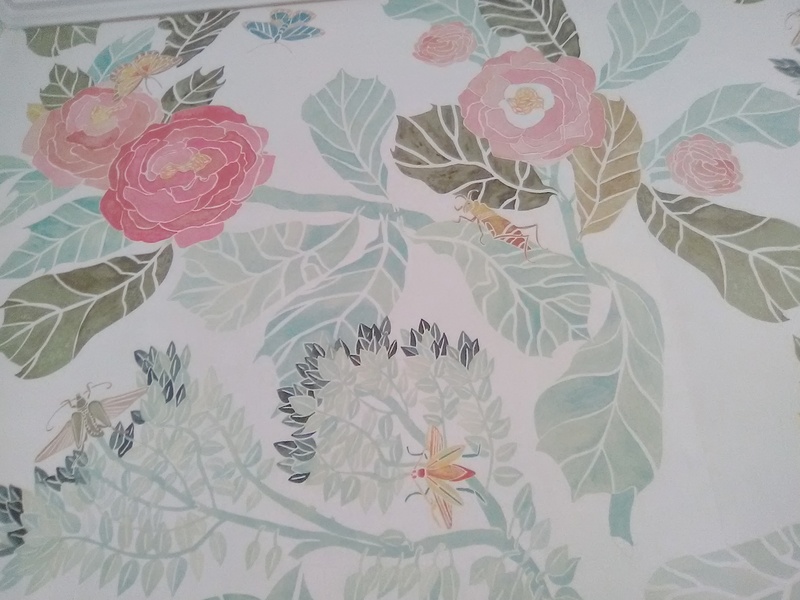 It’s an overall foliage pattern with realistic delicate birds and insects, and a pattern that matches across the seam from strip to strip. 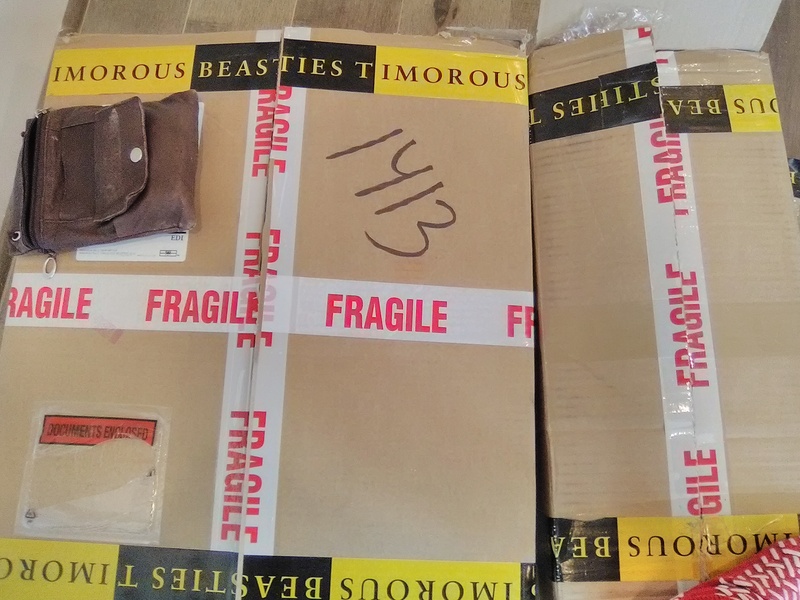 But when I opened the shipping box, the paper that we received was a very large and bold non-repeating vertical stripe. There were large forest creatures and plants drawn in a whimsical style. The design did not cross the seams, so there was no pattern match. Obviously, the sample the homeowner had received was not the same as what we had received. Happily, the wild and bold forest scene is what she wanted. Like yesterday’s pattern by the same manufacturer, this is one long mural-like design that runs through the entire 33′ long bolt without any element or motif being repeated. 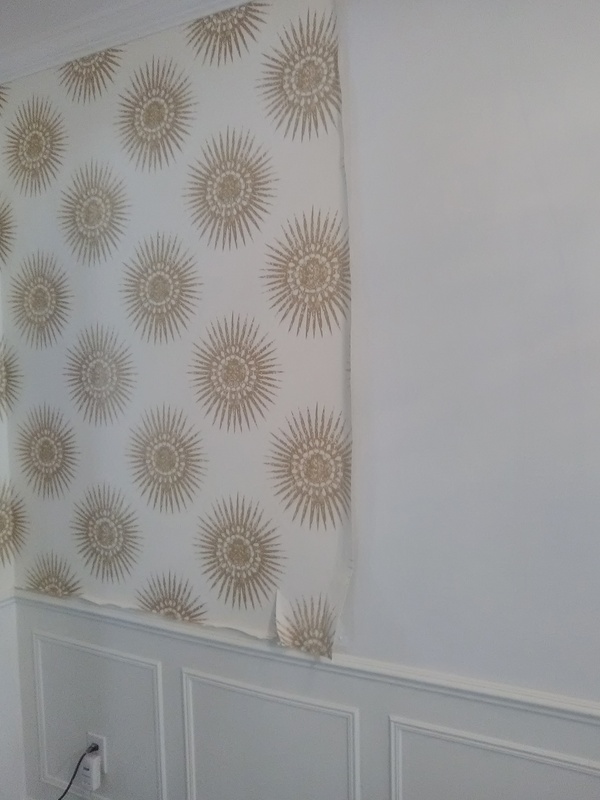 The pattern does not cross the seam, so there is no match – you are free to place any element of the design at any position on the wall you wish. Of course, you want to make sure not to place the same squirrel, for example, at the same wall height on every strip, and especially not on two strips next to each other. This will be a bit of a mind-bender to plot and lay out, and will take up a lot of space on the floor while I roll out all the bolts to get a good look at the pattern. I’m looking forward to this challenge. Plus, the beautifully-drawn pictures and the fairy tale-like feel of the design are mesmerizing, juxtaposed with the strong pattern color and width and the swirling vertical movement. I can’t wait to see how it transforms this dining room. More in a day or two … !! 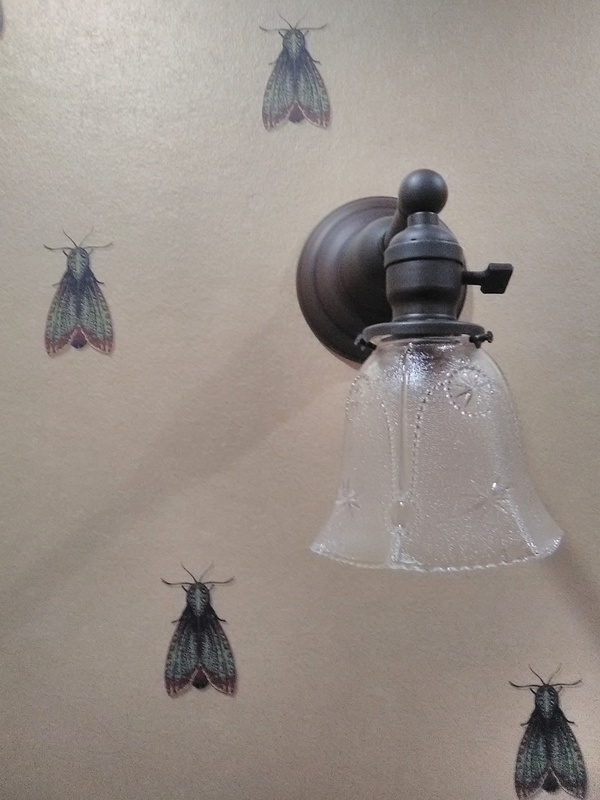 Timorous Beasties makes some unusual wallpapers, with most of them including animals or insects in the design. It’s cool stuff! This particular pattern, called Ruskin Floral, was more than a bit of a challenge to plot and hang. 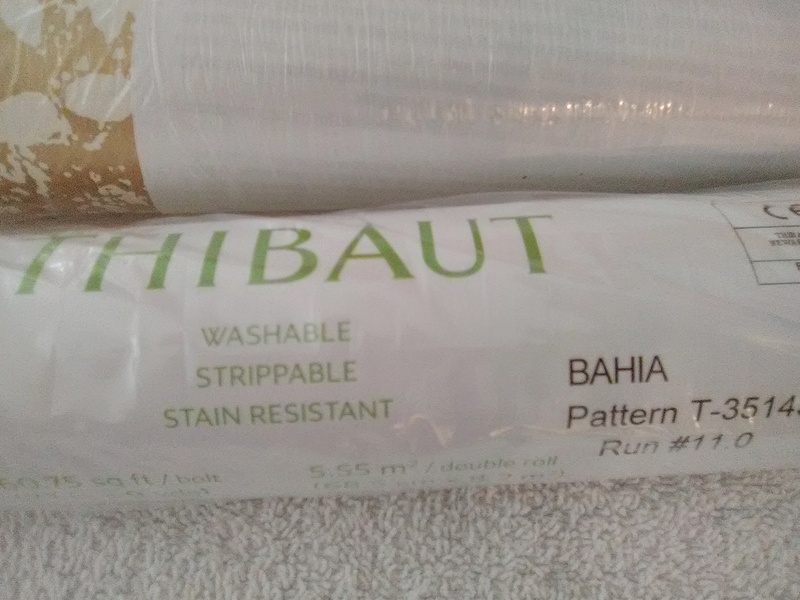 The manufacturer said there was no pattern match, but just a subtle impression in the textured background that could be matched if you wanted to, but was not necessary. They also said that this pattern match came at something like every 56″. And that it was a quarter-drop match (pattern motif repeats at the same height in the strip every fourth strip). All of this info was wrong. It turned out that the tree branches in the design did match across the seams. And the pattern repeat was more like 36″, instead of 56″. And, yes, you could have matched the design as a quarter-drop – but it looked better as a traditional half-drop (repeats every other strip). But what was most unexpected was that the design had these areas of darker foliage that appeared mid-way through the bolt. 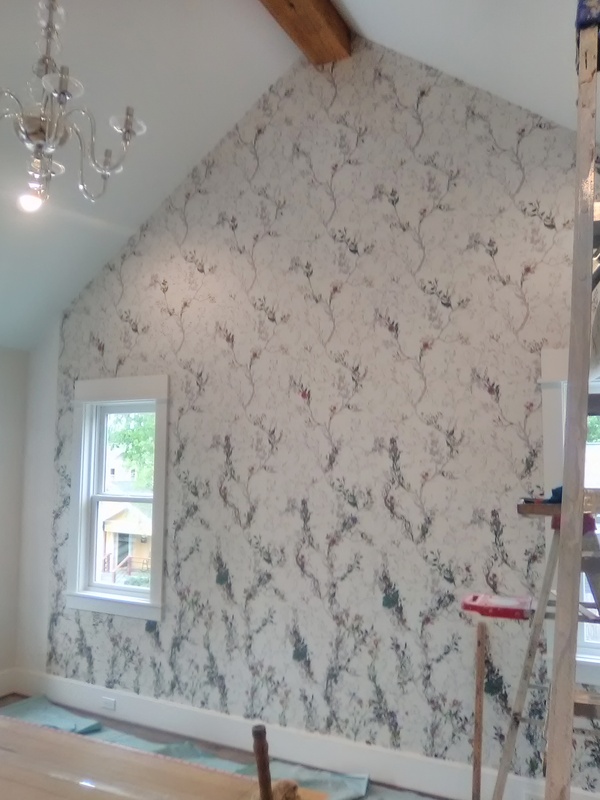 In every photo that I saw on the manufacturer’s website or on-line, only the picture of the sparse tree branches was pictured (what you see at the top of the wall in the top photo). Even though I rolled out several feet of each bolt on the floor, I had no idea that there was this other area of colorful and full foliage and insects, which you see at the bottom of the wall in the top photo. I plotted and got my first strip in the center of the wall, and then pinned the second strip next to it. Once I stood back, I was able to see that the foliage got darker and fuller as it dropped closer to the floor. I had not anticipated that. With 13′ high walls and 13′ long strips, and 33′ on each bolt of paper, there were 20′ more feet (one more strip) left on each of those two first bolts. But when I pulled more paper from the bolt and pinned it temporarily to the wall, matching the background tree branch motifs, this new strip, which had started from the middle of the first bolt (the first 1/3 of the bolt was now on the wall), was full of colorful foliage – which did not meld well with the sparser tree branch area on the first two strips that were now on the wall. 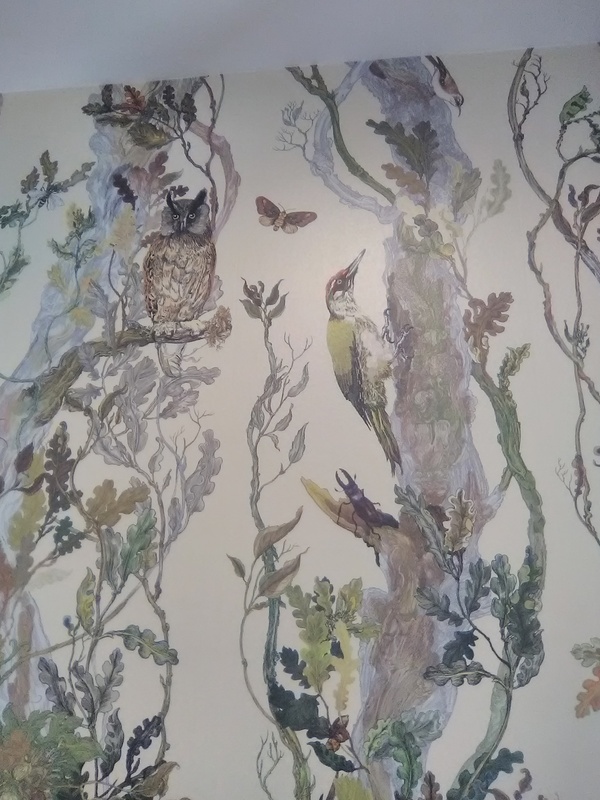 If I hung this new strip next to the two existing strips in the center of the wall, I would have had two sparse tree branch areas in the center, and then a stripe of darker, fuller foliage directly horizontal to it. At first, I was going to go this route, because it made the best use of the number of rolls we had (two strips from each double roll). I planned to put two strips of darker foliage next to the two strips of lighter tree branches. 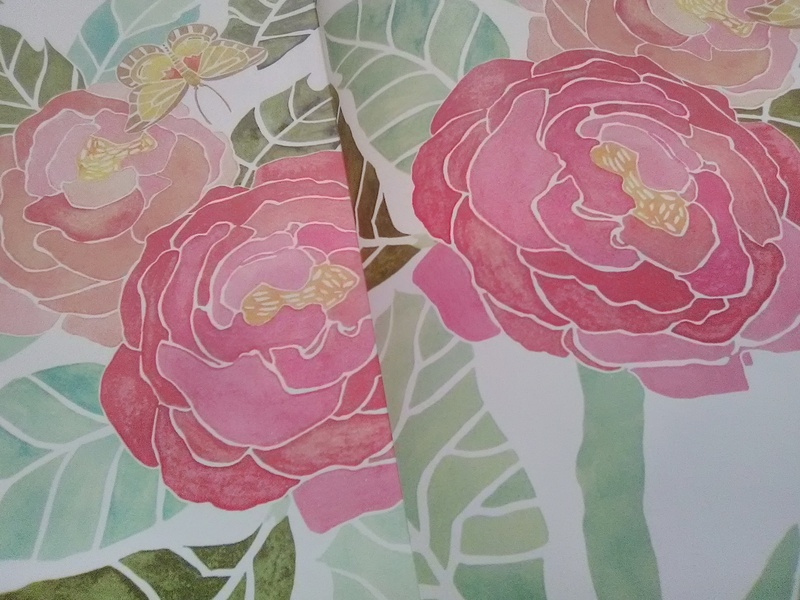 I also contemplated taking off the two center strips (the ones with lightly leafed foliage) and replacing them with ones that had more color and fullness. 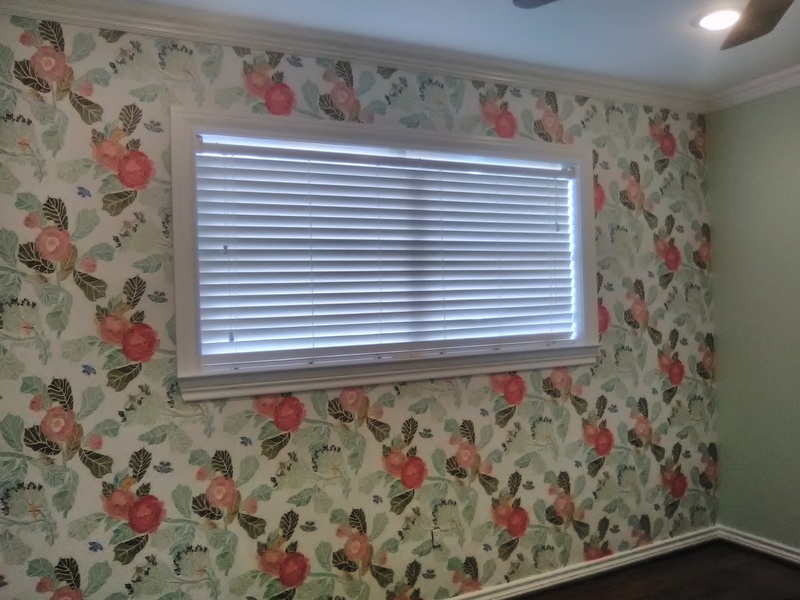 But I realized that if all the pictures I had seen of this pattern showed the sparse areas, then that’s what the homeowner had seen, too, and she probably was not expecting to see the very dark and full and busy heavily-patterned area, especially not at the top center of her accent wall. Even more compelling – we didn’t have enough paper for me to rip off and discard two 13′ high strips. I spent about an hour and a half contemplating various possible options. Just then, the interior designer walked in – and she was just in time. Two sets of eyes are better than one. By then, I had a number of strips pinned to the wall, to see how the pattern could be played out. She didn’t like my idea of hanging two sparse strips, flanked by two heavily pattered strips – she thought it looked top-heavy, especially over the windows. We fiddled some more, knocked around various options, and finally concluded that, even though the bed would be obscuring much of the fuller pattern, the wall looked better with the sparse area up high, and the fuller floral area near the floor. I studied the 33′ long bolt I had rolled out on the floor, with the lighter area at the top, the fuller area in the center, and then tapering off to a lighter area toward the end of the bolt. Our decision meant that I could get only one strip of paper out of each double roll bolt. The problem with that was that I needed 10 strips, but only had 8 bolts. We’ll come back to that in a minute. The next issue was that quarter-drop pattern repeat. 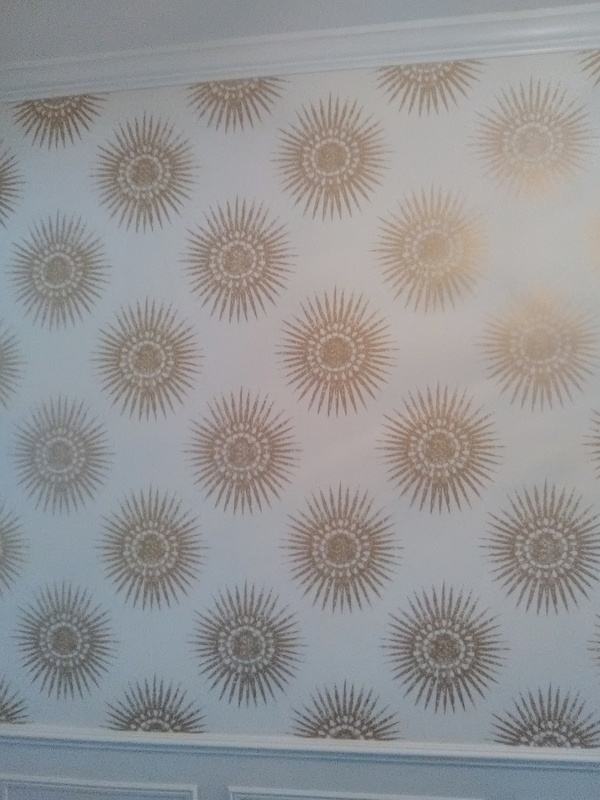 And that sloped ceiling, which also effected the way the pattern hit the wall. If I used the paper the most economically, and matched the first tree branches as they came off the roll, then that quarter-drop pattern match would have started marching diagonally up and across the wall, and then dropped down again, 7′ to the right. Nothing wrong with that, but it’s a look that would play out better on a larger space, such as a full dining room, not one accent wall in a bedroom. After more fiddling, I realized that the pattern was printed on each bolt exactly the same; in other words, the design was more like a mural. With one strip per bolt, the design was played out across alternating “A” and “B” bolts. If I ignored the sloping ceiling and cut each strip to the full height of 13,’ I could ensure that specific flowers in the darker area near the floor would hit the wall at the same height, lending a homogenous and pleasing rhythm to the pattern. But now we get back to the wall that needs 10 strips, but we only have 8 bolts of paper (one strip per bolt). In the top photo, all the paper has been hung except that last strip to the left of the window. (There is a mirror image on the right side of the wall.) That area was about 9′ high. Since I had already taken approximately 13′ off each 33′ long bolt, I had about 20′ still left. But since that started in the center of the bolt, it was an area full of the heavier colored and printed pattern. Even though the pattern of the tree branches would match, I didn’t want to place that darker strip next to the lighter strips already on the wall. It might have looked interesting, as a sort of darker “frame” for the outer edges of the wall – but, like the interior designer, I thought it would look too dark and heavy and lopsided. I remembered that the pattern thinned out again as it moved toward the bottom of the bolt. 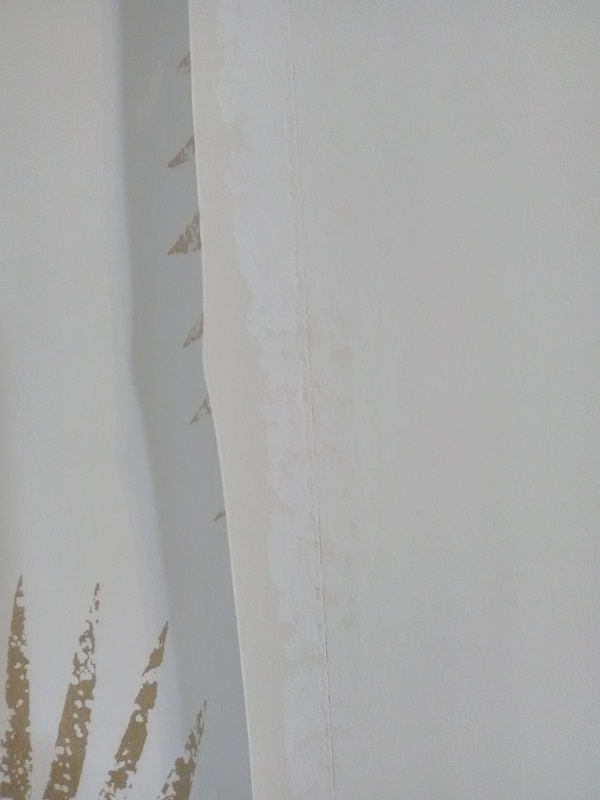 So I unrolled the paper down to the bottom, and then, working from the bottom instead of the top, I found the pattern match that corresponded to what was on the wall, and cut it to fit the height of the wall. Trimmed and put in place, it looked pretty darned good. This piece (and it’s twin on the opposite side of the wall) didn’t have nearly as much dark foliage at the bottom as the other strips. At first I was going to cut some flowers out of scrap paper and appliqué them to fill in the void areas. But I realized that was getting kinda obsessive over something that few people would even notice. It was just a 12″ wide strip, and there will most likely be furniture in front of it, and we were able to get by without having to buy two extra double rolls (which would have been different runs (see previous posts). 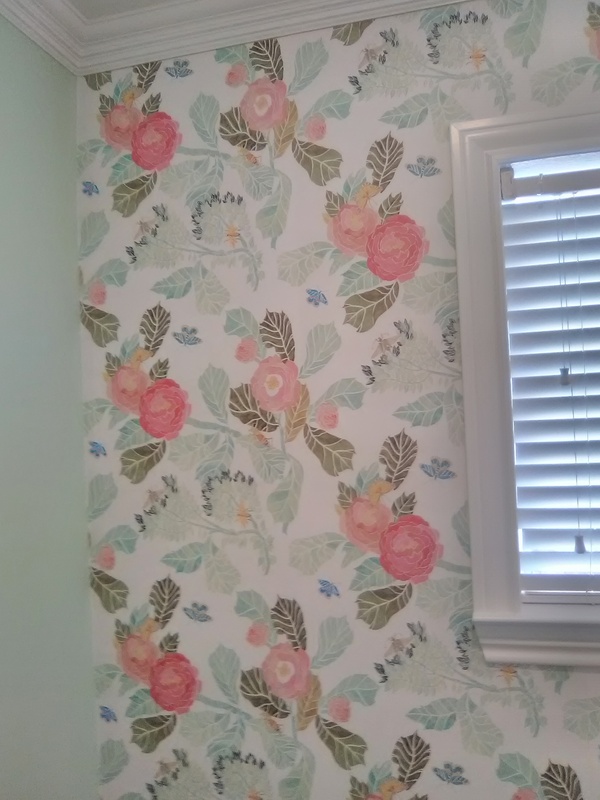 Getting this wall with a tricky pattern match to look good was a mix of luck, skill, mathematics, and having purchased enough paper. Always buy more paper than you think you will need. The interior designer is Stacie Cokinos of Cokinos Design, and the home is in the Woodland Heights neighborhood of Houston. Here’s a bright and cheerful, watercolor-y pattern that is popular for little girls’ rooms. I hung it on an accent wall in a toddler’s room in a home in the Timbergrove neighborhood of Houston. The name of the pattern is “Ants,” and it’s sold through Anthropologie. 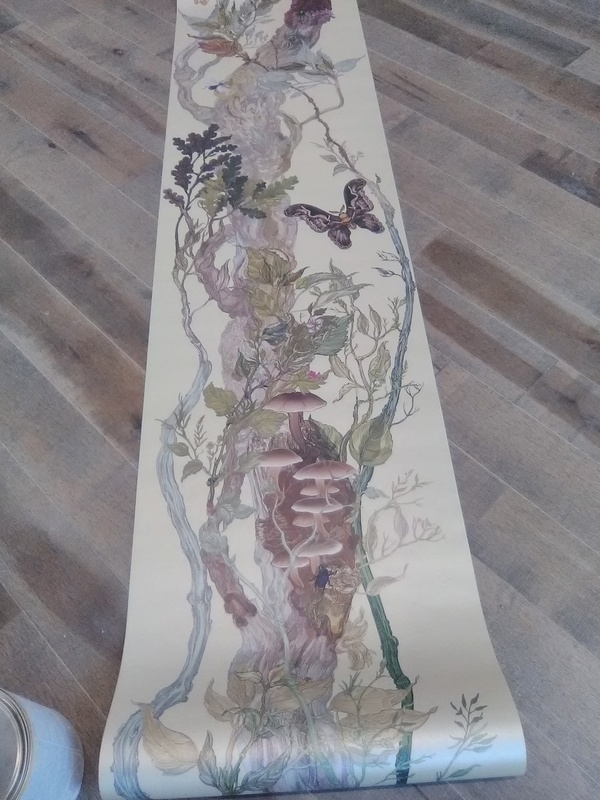 The manufacturer is York, and it’s in their Sure Strip line of pre-pasted, thin non-woven, easily removable papers, and is one of my favorite brands to hang. Here’s a great article about murals made more affordable for the average homeowner.